Girls of the Golden West. 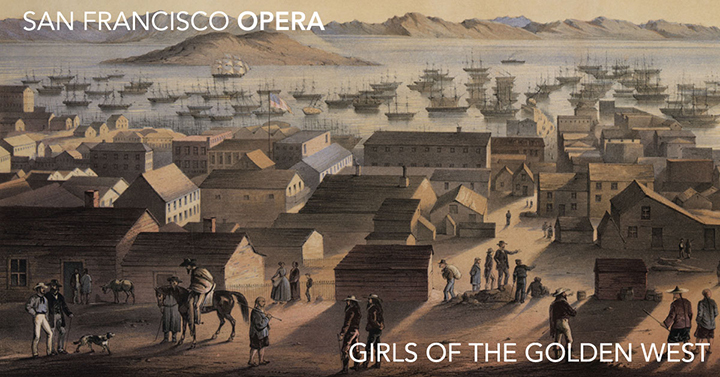 Just in time for the holidays, take your friends and family with you December 2 to see the new opera commissioned by SF Opera: "Girls of the Golden West". Sourced from historical writings including “The Shirley Letters”, this world premiere opera follows remarkable characters who flock to Gold Country hoping to strike it rich but are quickly caught up in the optimism, greed and prejudices of a rapidly changing world. Dame Shirley, in her letters from the California mines 1851-1852, said “You have no idea of this wild and barbarous life.” Composer John Adams’ music is wonderfully enriched by Peter Sellars’ libretto in English. A 30% discount is offered to club members; the direct link is http://sfopera.com/offer?offer=33174 or you can go to the Opera’s offer page: http://sfopera.com/offers and use the promo code: HRVBUSGGW. Prior to the 7:30 performance, join your fellow alums at a reception beginning at 6pm and enjoy a short presentation by Jennifer Lynch, San Francisco Opera's Managing Director: Philanthropy and Audiences beginning at 6:45pm in the Dress Circle North bar in the Opera House. The Dress Circle level is located 3 flights up from the Lobby level. You are welcome to purchase a beverage at the bar nearby and enjoy it while you network with other alums and then learn more about the effort involved to commission and premier a new opera.